"It is difficult to swallow a defeat like that. ... We have a good opportunity to turn it around in the second game. The goals we conceded were difficult to imagine in a Champions League game." --Arsène Wenger, Porto 2 - 1 Arsenal, 2010. "It was of those nights you never forget. It is our worst night in Europe, we were punished and deservedly so. We were very poor offensively and defensively. We were beaten everywhere. There was not one moment in the 90 minutes we were really in the game." --Arsène Wenger, Milan 4 - 0 Arsenal, 2012. "We played against a good team who took advantage of every opportunity they created in the first half. We had quite a good start for five minutes. You could see we were a a bit nervous, but Bayern was fully confident and we paid for it." --Arsène Wenger, Arsenal 1 - 3 Bayern, 2013. "I just feel frustrated. It was a great football game until half-time and it was no game at all after half-time. And on a European night that's really frustrating because the game delivered what it promised at the start, but it was not the same game in the second half." 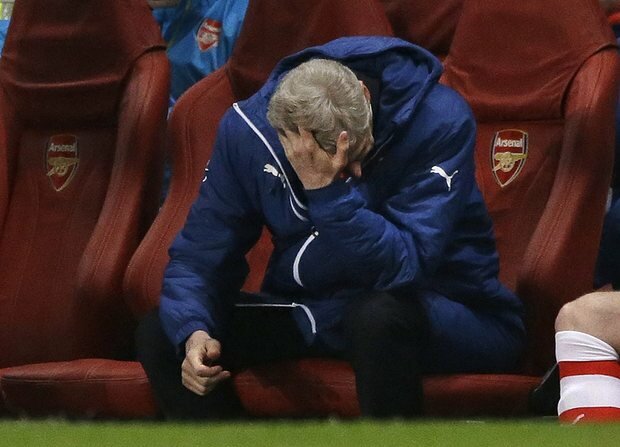 --Arsène Wenger, Arsenal 0 - 2 Bayern, 2014. "On our side, I believe that we missed the chances and we were a bit suicidal defensively. We were not at the level defensively and we were a bit unlucky as well because the first goal is deflected. On the second and the third goal we were suicidal." --Arsène Wenger, Arsenal 1 - 3 Monaco, 2015. "Of course I’m disappointed because we put a lot of energy into this game. I felt that we lost at the moment that we looked more capable of winning the game, and we also lost it in a way which we could not afford to give them." --Arsène Wenger, Arsenal 0 - 2 Barcelona, 2016. Arsenal have not won a Round of 16 tie since overcoming the 2-1 deficit to Porto in 2010. They have won once in the first leg since 2009. There's a lot of negative history here, but it only takes 90 minutes to change that. Here is a tall man at an airport. Granit Xhaka returns from his four match domestic suspension (not that that would have kept him out of this European fixture anyway,) and was on the flight to Germany, though whether Arsène Wenger throws the Swiss international straight back into the side in a fixture of this magnitude remains to be seen. Aaron Ramsey is still out with a calf injury picked up against Watford, but Mohamed Elneny is available again after the Africa Cup of Nations. Lucas Pérez did not make the trip, as he is out with a hamstring injury picked up in training. 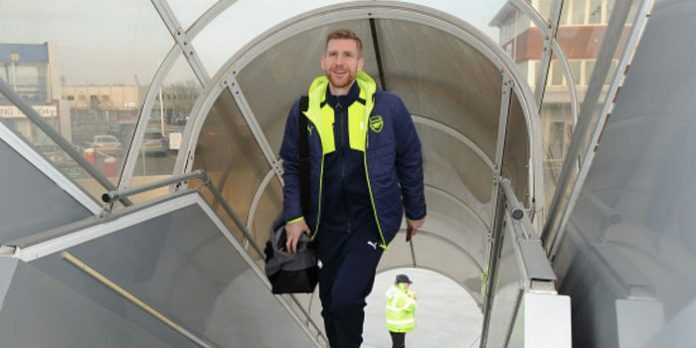 Danny Welbeck and Per Mertesacker, both injured throughout the fall, have been added to Arsenal's Champions League roster after being left out through the group stage. The exceedingly tall German made the flight, but will not be very likely to make an appearance. There have been calls from various corners of the Internet to drop Mesut Özil from this match, as he's been struggling lately, but if you don't start your most creative midfielder in a knockout round Champions League tie, you are certifiably insane, dip in form notwithstanding. David Ospina will start in goal, that's been confirmed. Olivier Giroud has a history of scoring against Manuel Neuer, but I wouldn't start him here. Predicted XI: Ospina, Bellerín, Mustafi, Koscielny, Monreal, Coquelin, Elneny, Welbeck, Walcott, Özil, Alexis. Here is Boateng in training not being hurt. Franck Ribéry has missed the last two weeks with a thigh injury he picked up in training and, while he could make an appearance on the bench, manager Carlo Ancelotti has said he is not likely to be risked. It's not like Bayern Munich have a lack of options in attack. 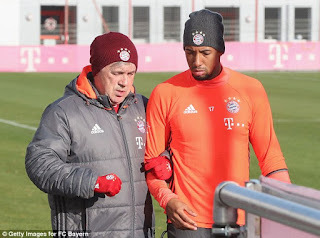 Jérôme Boateng has been out since late December with a chest injury, though that largely coincided nicely with Germany's winter break. Boateng needed surgery to repair a damaged tendon. Javi Martínez has deputized in his place, pairing with Mats Hummels in the center of defense. Boateng, who is likely unavailable anyway, and Philipp Lahm are both one booking away from an accumulation ban. Predicted XI: Neuer, Lahm, Martínez, Hummels, Alaba, Alcántara, Alonso, Vidal, Robben, Müller, Lewandowski. a Chilean at the weekend. 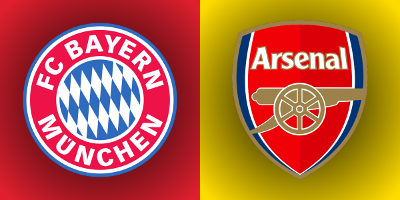 Arsenal and Bayern both won 2-0 at the weekend against relegation fodder, though Bayern left it later than Arsenal. The Gunners, of course, beat Hull City 2-0, with Alexis Sánchez scoring both, the first with his hand and the second with a crappy penalty. 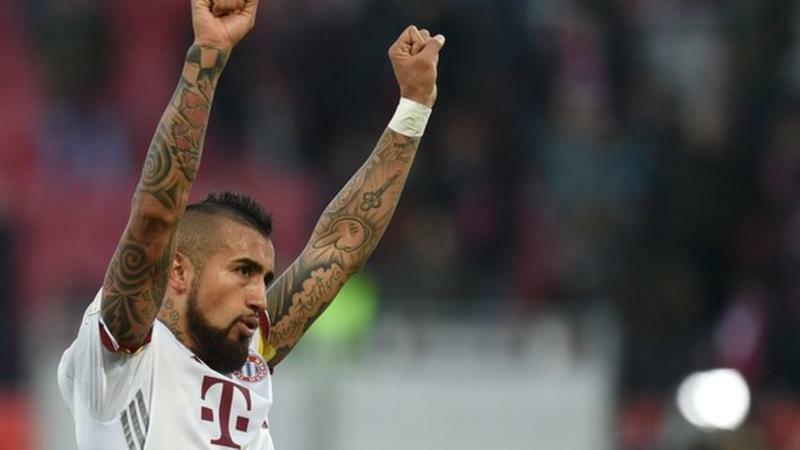 Bayern didn't score their first until the 90th minute when Arturo Vidal finally put one past Ingolstadt. Substitute Arjen Robben added a second two minutes later. That might be the only real comparison you can make between the form of these sides since December. Bayern have not lost across all competitions since they lost at Rostov on Champions League matchday five; the German winter break helps with that a little bit, of course, but it's still 10 wins and a draw in their run. At home, their form is even better; they have not lost at the Allianz all year and have won 15 straight Champions League home games. Only three teams have gotten a draw at the Allianz this season: Köln, Hoffenheim, and Schalke. Only three teams have beaten Bayern at all: both Rostov and Atlético Madrid in Europe and Borussia Dortmund in the Bundesliga. The losses to Dortmund and Rostov were in consecutive fixtures; again, they have not lost since. Over the same period of time as Bayern's current 11-match unbeaten run, Arsenal have a record of 11 wins, a draw, and five losses. Arsenal did beat Bayern last year. This is a picture from it. I'm not kidding, look it up. 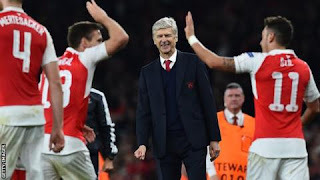 This will be the fourth time in the last five years that Arsenal have been drawn against Bayern Munich at some stage in the competition; it is the third time that meeting is coming in the Round of 16, though it is the first time Arsenal are the higher seed. In the six recent matches, Arsenal have won twice, lost three, and drawn once. In the 2013 Round of 16, Arsenal spotted Bayern a 2-0 lead at the Emirates in the first leg, with Toni Kroos and Thomas Müller notching goals. Lukas Podolski pulled a goal back, but Mario Mandžukić's goal in the 77th minute gave Bayern a critical third away goal. Arsenal snatched a 2-0 win at the Allianz in the return leg, with Olivier Giroud and Laurent Koscielny scoring goals, but the Gunners were eliminated 3-3 on away goals. In the 2014 Round of 16, Arsenal won an early penalty, but Mesut Özil's spot kick was saved by Manuel Neuer. Later in the first half, Wojciech Szczęsny was sent off, but David Alaba hit the post with the ensuing penalty. Like the year before, however, Kroos and Müller scored to give Bayern a 2-0 win. The return leg was less dramatic than in the previous year, as Özil injured his hamstring early on and played hurt for the rest of the first half (this was the impetus for Neil Ashton famously saying he was "nicking a living.") Bastian Schweinsteiger put Bayern up 3-0 on aggregate with a goal in 55th minute. Podolski again pulled one back, this two minutes later, but it was only enough to earn Arsenal a draw on the night. Bayern could've won the match outright late, but Łukasz Fabiański saved a Müller penalty in injury time. In last year's group stage, Arsenal lost their opening two matches, but then stunned Bayern 2-0 at the Emirates, with Olivier Giroud and Mesut Özil scoring in the 77th and 94th minutes, respectively. Bayern roared back in the next meeting, taking a 3-0 halftime lead, en route to a 5-1 victory in which Giroud was Arsenal's only goal scorer. Giroud does have a knack of scoring against Neuer; after those two group stage goals, Giroud added another in a friendly against Germany in November of 2015, making him the only player to score goals in three consecutive matches against the German goalkeeper. That streak was snapped at the Euros. In their two previous trips to Munich before all of these recent ones, Arsenal lost on both occasions: 1-0 in 2001 and 3-1 in 2005. The match officials are from Serbia; the referee is Milorad Mažić. Arsenal have had Mažić twice in the past, winning 2-0 over Napoli at the Emirates in the 2013 group stage and drawing 0-0 at Beşiktaş in Istanbul in the first leg of the 2014 playoff (which Arsenal eventually won by winning 1-0 at the Emirates.) Mažić has never worked a Bayern Munich match. That said, he's been involved with their players in other ways. Mažić worked the 2014 World Cup group stage match between Germany and Portugal in which he sent off Pepe for a headbutt on Thomas Müller. 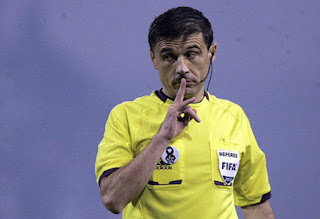 In 2015, Mažić worked a Champions League quarterfinal between Atlético Madrid and Real Madrid in which he issued five bookings; in two cases, those yellows caused players to be suspended through accumulation for the second leg. Mario Suárez, one of the players suspended, said afterward, "they can't use a Serbian referee for these types of games." Suárez had to apologize later and clarify that he meant referees from only the top European domestic leagues should work late-round Champions League ties, which is also stupid. In July of 2015, the Egyptian FA hired Mažić to referee the country's biggest derby, between Cairo sides Al Ahly and Zamalek; the match had to be played at a neutral venue in Alexandria behind closed doors. John Painting is a contributing writer to the Modern Gooner and is also bad at overcoming first leg deficits. You can follow him on Twitter @zorrocat if you have any advice.